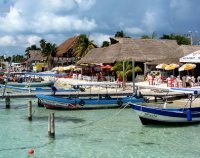 Once a small, unremarkable fishing village, these days Cancun the reason most people visit Mexico. It is made up of two parts: the glitzy hotel zone dedicated to tourism, and the downtown area inhabited by the permanent residents. A different atmosphere prevails in each, with a dramatic contrast between the air-conditioned shopping malls, chic restaurant dining, spring break vacationers and wealthy pleasure-seeking tourists in one; and bustling market street stalls, noisy vendors, and the daily grind of people at work in the other. The hotel zone, situated on a thin strip of land (Isla Cancun) in the shape of a figure '7', is what people imagine when they talk about Cancun. It is a vision of Caribbean paradise with soft white sand beaches and clear blue-green waters. There is plenty of high quality holiday accommodation available, a wide choice of restaurants and shops, a notoriously energetic nightlife, and an array of activities, including both land and water sports. 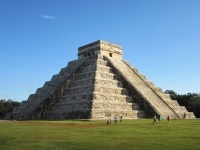 Cancun is also a good base from which to explore some of the nearby attractions, particularly the ancient Mayan site of Chichén Itzá on the mainland, which is the best restored and most famous of the archaeological sites on the Yucatán Peninsula. Shoppers can rejoice in Cancun, with a choice of seemingly endless shopping facilities, from ultra-modern malls with chic boutiques to street vendors, open-air markets and department stores. The Plaza la Fiesta is a favourite shopping venue in the Hotel Zone, and there is also a popular handicraft bazaar, El Zocalo, opposite the Convention Centre. Numerous malls line the main drag of Paseo Kukulkan that runs down the eight-mile (13km) hotel strip. 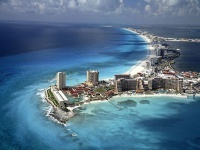 Prices, however, are better in Cancun City itself, also known as Centro, on the mainland. There are some good shops along Yaxchilan Avenue, and the market on Tulum Avenue is recommended for buying silverware and Mexican handcrafts. Credit cards are accepted almost everywhere in Cancun. If you use cash you may have the 15 percent sales tax deducted if the shopkeeper is willing. Expect to bargain in the markets. If offered black coral, refuse, because it is an endangered species and you could run into problems taking it back home. Shops in Cancun are generally open between 10am and 2pm, and 4pm and 7pm on week days. Many stores choose to stay open during the 'siesta' hours from 2pm to 4pm, but some may close. On Saturdays most shops only open for the morning. A few open on Sunday until 1pm. Shops in malls tend to open weekdays only from 10am to 8pm. Cancun's wide variety restaurants will be able satisfy every palate, with high-class eateries and familiar franchises, to taco stands and fast-food joints. Those who wish to eat like the locals can be assured that Yucatan cuisine is regarded as the finest in all Mexico, combining Mayan and Spanish influences. Local dishes worth sampling include cochinita pibil (suckling pig baked in banana leaves with annatto sauce) and panuchos (tortillas with fried black beans, chicken and pickled onions). Seafood is also plentiful. A popular romantic option is to book for one of the numerous dinner cruises offered. For a true taste of Mexico visitors can pay a visit to one of the many cantinas, traditional bar-restaurants, which are situated mainly around the downtown bullring. The atmosphere at the cantinas is particularly lively on Wednesday afternoons after the weekly bullfights, but the food and drink is good quality and good value for money every day of the week. Cancun's nightlife is legendary, with its huge choice of nightclubs, discos and bars to suit every mood, from romantic to raunchy, funky to frenetic, rock to reggae and salsa to techno. After dark the city, particularly the Hotel Zone, comes alive, with most clubs opening around 10pm and pumping out the music until sunrise, or later, the next morning. Most clubs and pubs offer a continual variety of promotional or theme evenings, with foam parties, mini-skirt and bikini contests being hot favourites. Most offer ladies nights with free drinks for women. Hip and happening parties can be found at Dady Rock, Bulldog, The City, Dady O and Coco Bongo's nightclubs, all offering massive dance floors and pumping beats. The Party Hopper tour is a popular way to enjoy a number of Cancun's top nightlife venues; visitors pay about US$75 for free drinks and entry into three of Cancun's top clubs and bars. Those seeking some more cultural entertainment should not miss the internationally renowned Ballet Folklorico, which holds performances in various venues around Cancun, featuring lavish costumes and traditional dances. One of the main reasons for choosing Cancun as a holiday destination is to enjoy the gorgeous beaches with their powdery white sand washed by the warm, turquoise waters of the Caribbean. A wide variety of activities are offered on every beach in the tourist zone: volleyball, parasailing, snorkelling, scuba diving, swimming with dolphins or sharks, jet skiing, kayaking and so on. Alternatively, just relax in a hammock and enjoy some people watching. Diving and snorkelling are the most sought-after water pursuits of the energetic, with some of the world's most famous coral reefs on Cancun's doorstep. All equipment can be rented and dive operators are in evidence everywhere. Cancun also offers some excellent deep-sea fishing; charters can be arranged at hotels or one of the many marinas. 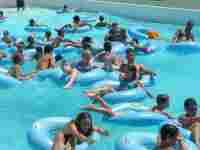 Thrills and spills can be had at the water park near Punta Nizuc. There are local Mayan ruins and archaeological sites to explore, an alligator farm, botany park, fun fairs and other attractions. The recently opened Museo Maya is a great place to get to grips with the Mayan culture and see some of the most interesting artefacts discovered in the region. There are also two championship 18-hole golf courses and numerous other sports facilities, including well-maintained cycling routes. Cancun is a fantastic vacation destination, even during peak season, and perhaps it has been justifiably called 'vacation utopia'. The resort is expensive, but most hotels offer all-inclusive rates which are generally good value. Petty crime is common, but sensible precautions should ensure there are no problems. Some visitors are afflicted by cases of diarrhea and fever, known colloquially as 'Montezuma's revenge', caused by unfamiliar bacteria in water and food. This can be avoided by drinking bottled water and taking care about over-indulgence in spicy Mexican foods, margaritas or Mexican beer. 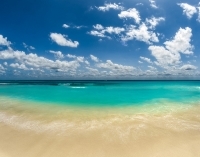 Cancun's beaches are extensive and spread out enough to never become too overcrowded even in peak season. The resort is exceptionally busy during America's Spring Break in March, when it is the favoured destination of thousands of college students from North America; those wanting a more relaxing and less frenetic holiday should visit Cancun outside this season.